I put this together for a class and thought I'd share it with everyone because it made me laugh. It's a little silly, a little sarcastic, and pretty much me. 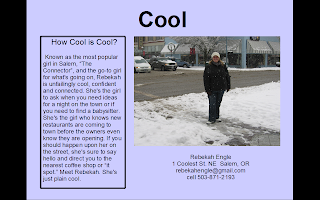 Rebekah you are cool. You are not only the mayor of Salem but I big help to me in the class room. Answering all of the many tech. questions I have. Hope we have more classes together in the future. Yes, you are very cool indeed! Fun to see how that project turned out. I see you did not foot note your tech support :) Just kidding. Thanks for coming by tonight to show off your new 'do :) Heidi told Rodney that her hair did not "die" so she did not need to get any new hair. When she heard me and Rodney talking about you "dying" your hair. Funny girl that one!